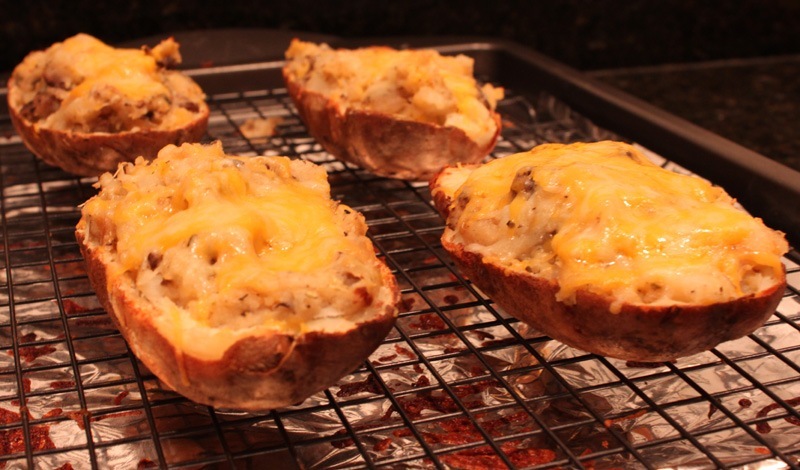 When I was a single lady I would have a baked potato for a meal all the time. Lunch or dinner, over and over again. I never got sick of them. Then I met John and the baked potato eating stopped. 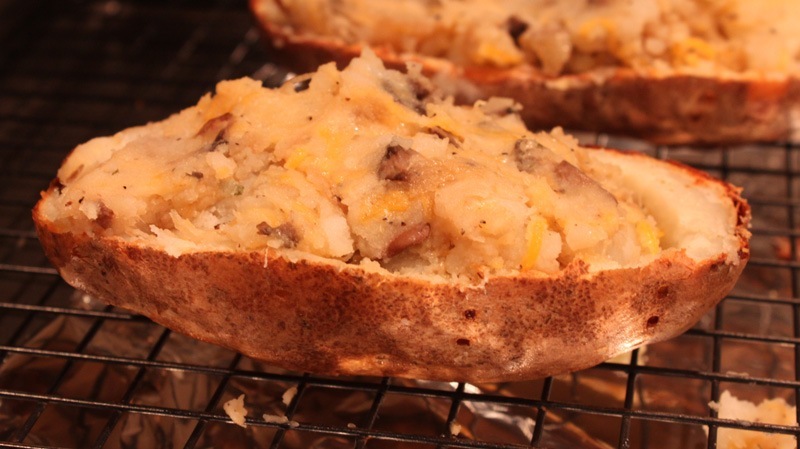 He isn’t a fan (which is crazy – who doesn’t love a buttery, warm, salt and pepper covered baked potato?!) so I rarely have them anymore unless we go out to eat. Compromises people, compromises. 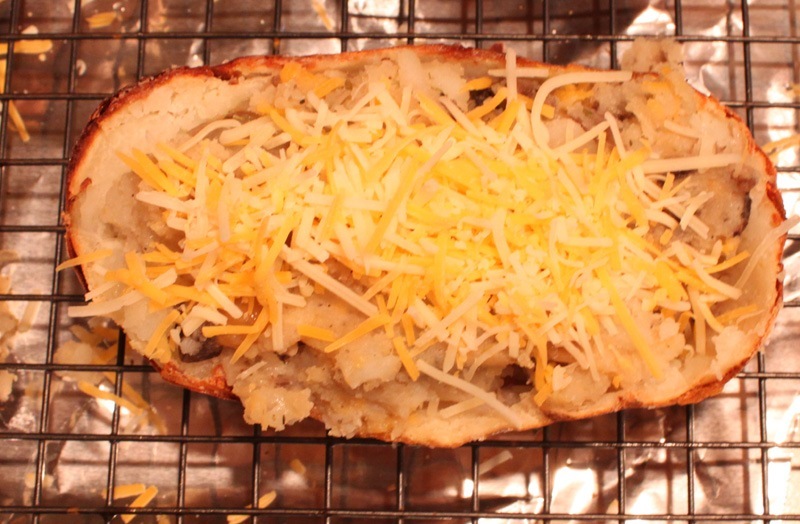 Lately, though, the baked potato craving has been too strong to ignore. So last Saturday night I told John I was making us a nice healthy dinner at home and not to ask questions. Mwahaha! Plus, I don’t always believe him when he says he doesn’t like something. The man will eat anything! Just to be safe though I jazzed this one up to make sure he’d love it. 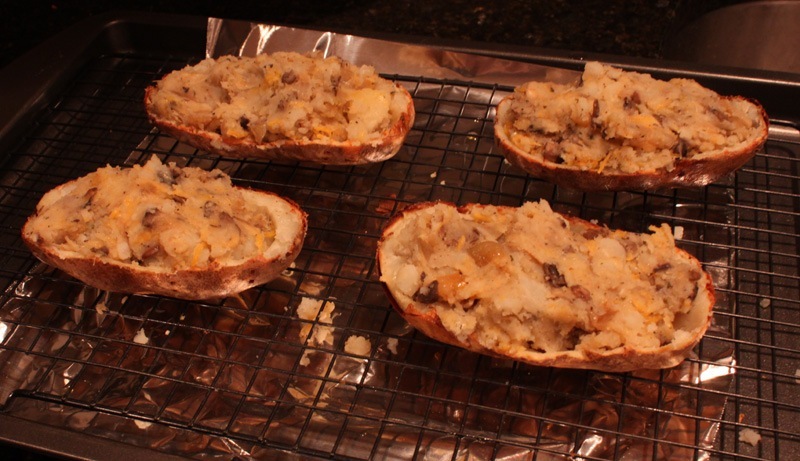 So, this is my fun twist on classic twice baked potatoes. Giada inspired me but I whipped this up mostly on a whim. 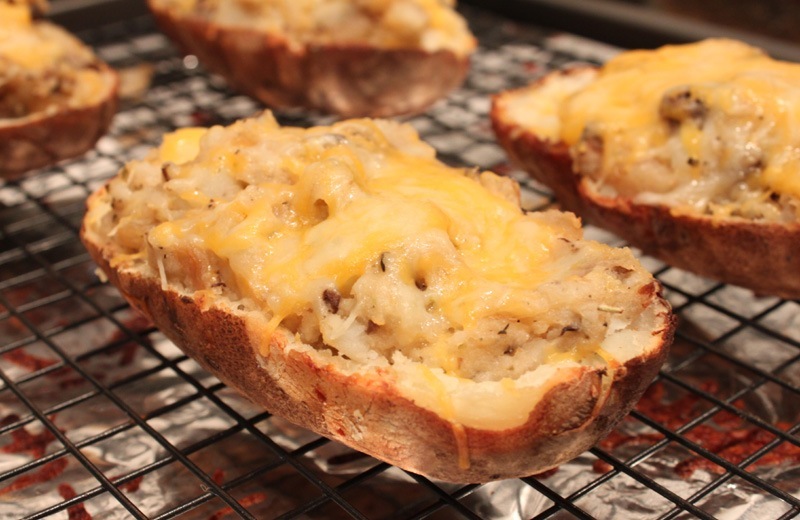 This ain’t yer grandma’s twice baked potato; it’s packed with tons of flavor and extra veggies! 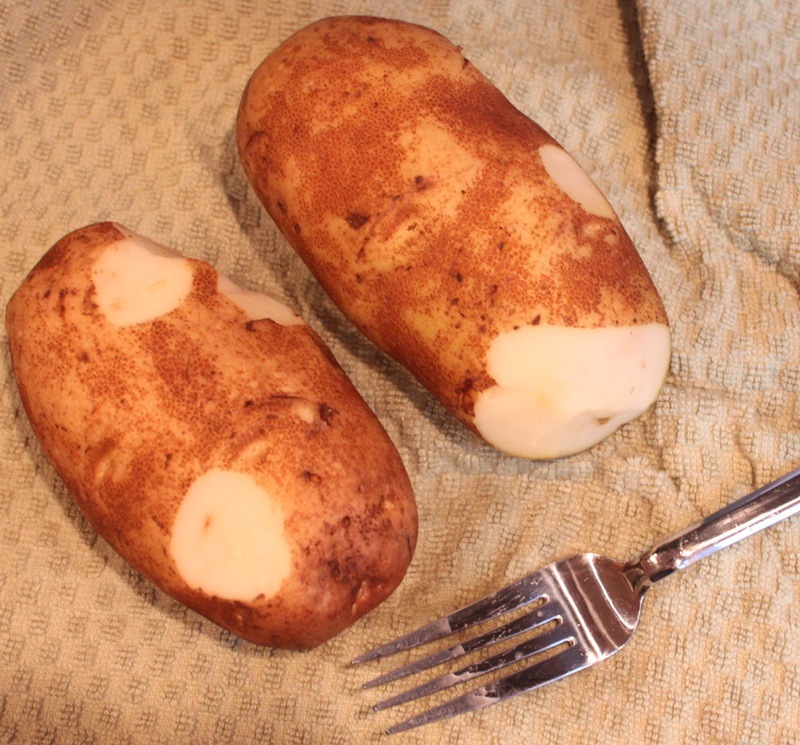 Start by washing, trimming, and poking holes in the potatoes. Bake in a 400 degree oven for 1 hour. 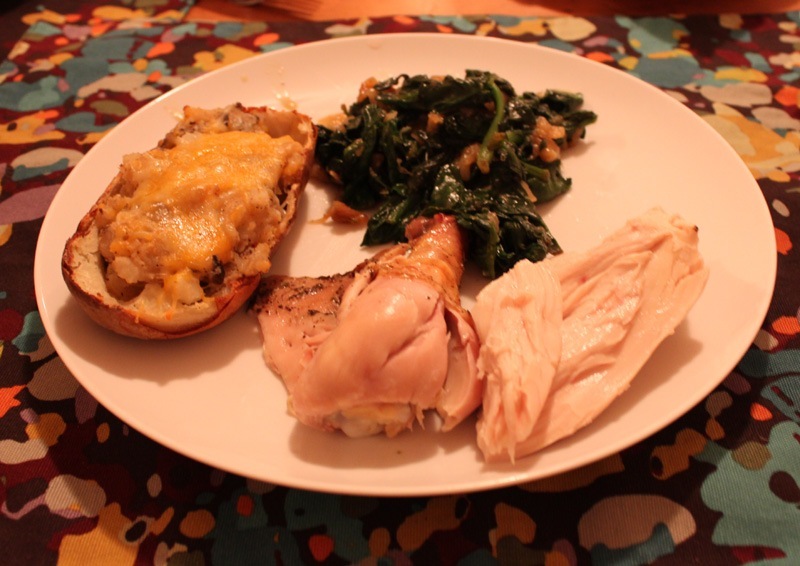 It may take a bit less or a bit more time to cook depending on your oven and potatoes. Check on them often and take them out when they feel done to you. I squeeze the sides and when the middle gives easily, I take them out. 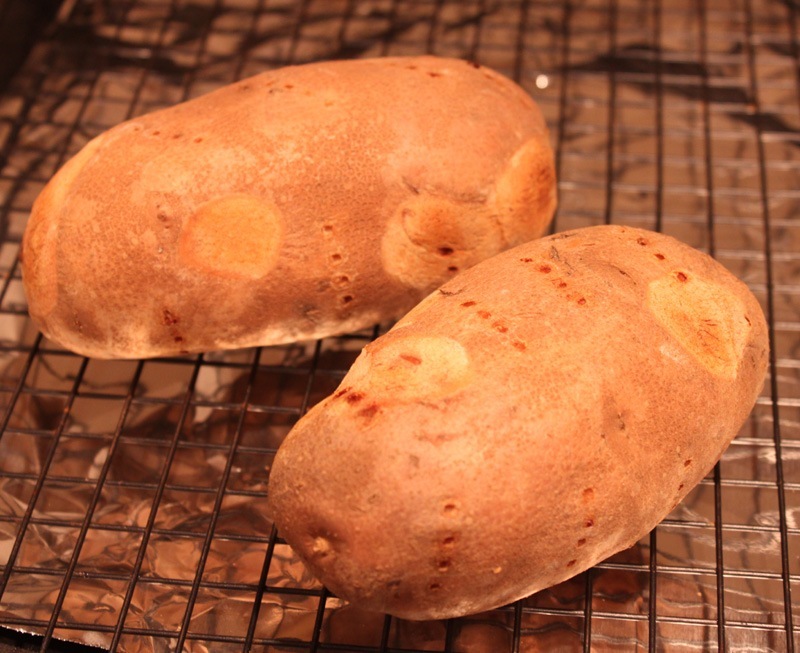 When they are done take the potatoes out of the oven, cut them in half, and let them cool for 20-30 minutes. On to the filling! 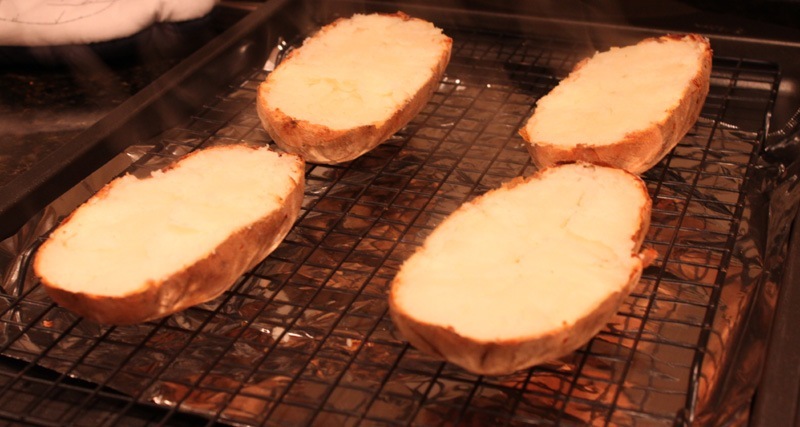 You can start this 15 minutes before you are ready to use your cooled potatoes. 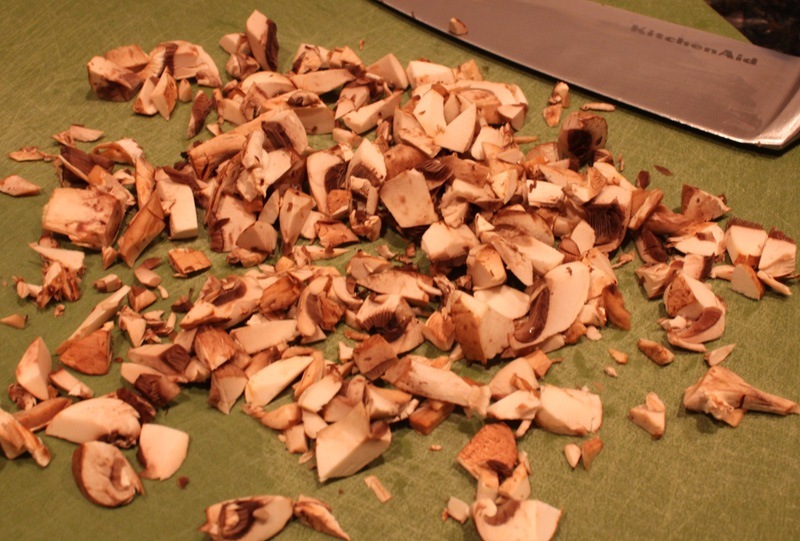 Chop the mushrooms. I use baby bellas here but you could use any variety you like. 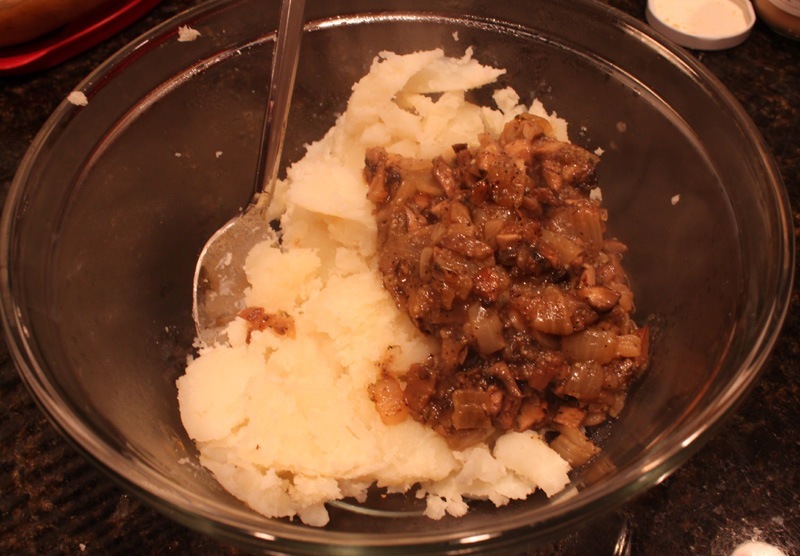 I pre-caramelized a huge batch of onions for the week so I made my filling in the same pot. I highly recommend doing this, so much flavor! 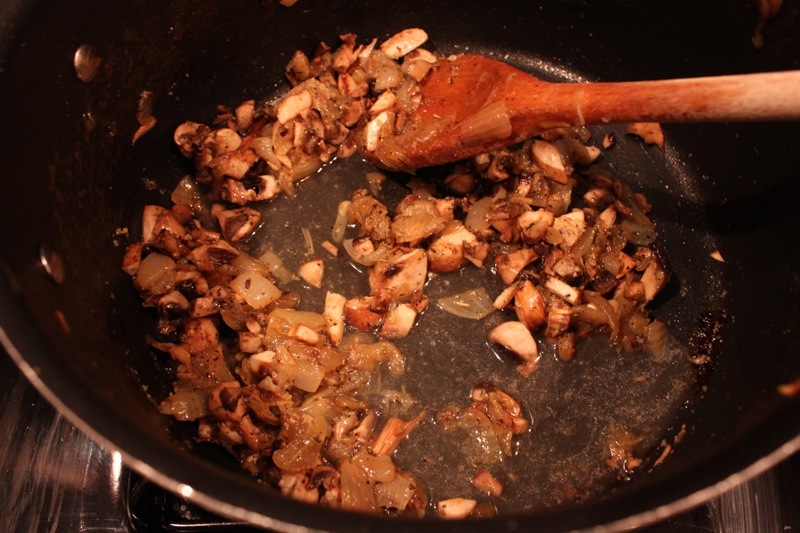 In your pot combine onions, mushrooms, garlic, chicken stock, and salt and pepper. 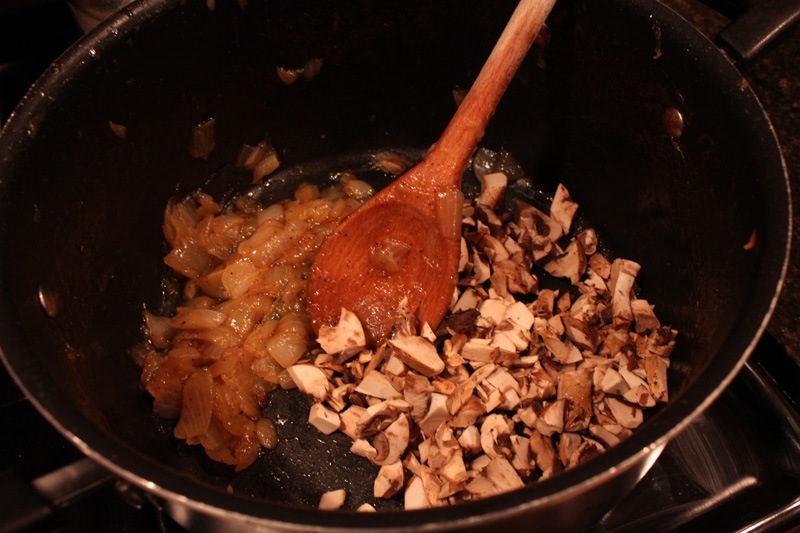 Cook for 7-10 minutes over medium heat or until the mushrooms have softened. 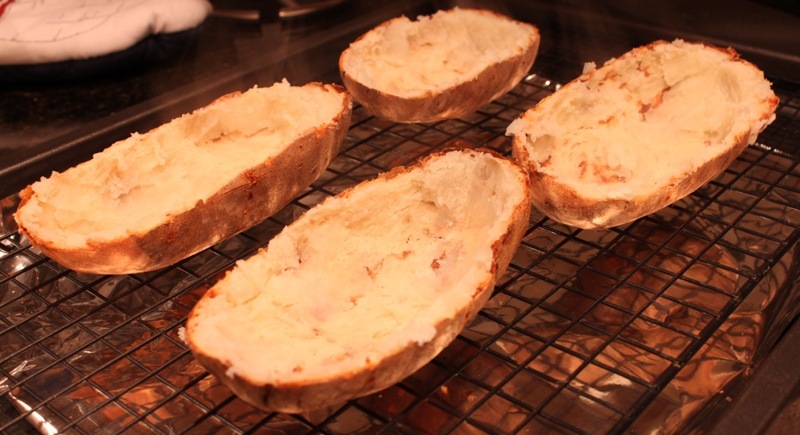 Now that the potatoes are cool, scoop the baked potato goodness in the middle into a bowl and set aside. Pour 1 tsp. 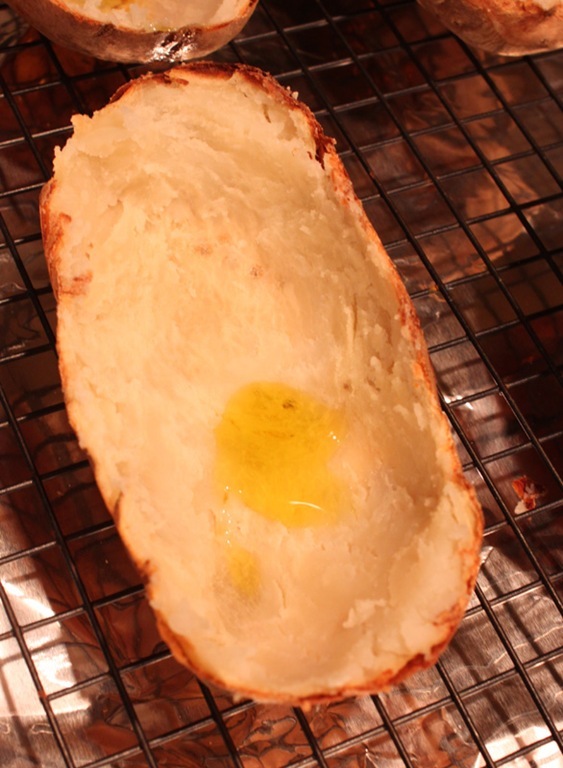 of EVOO into each potato half and rub liberally on the inside and outside. This is critical for nice crispy potato skins! 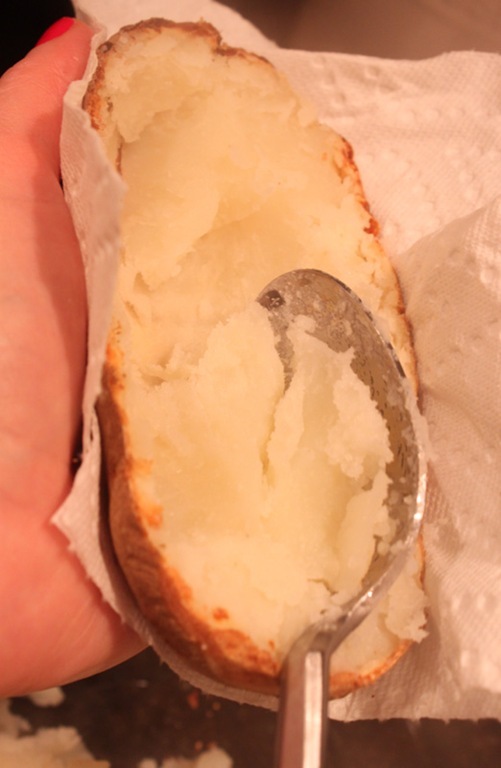 Add your cooked filling to the bowl with the potatoes. 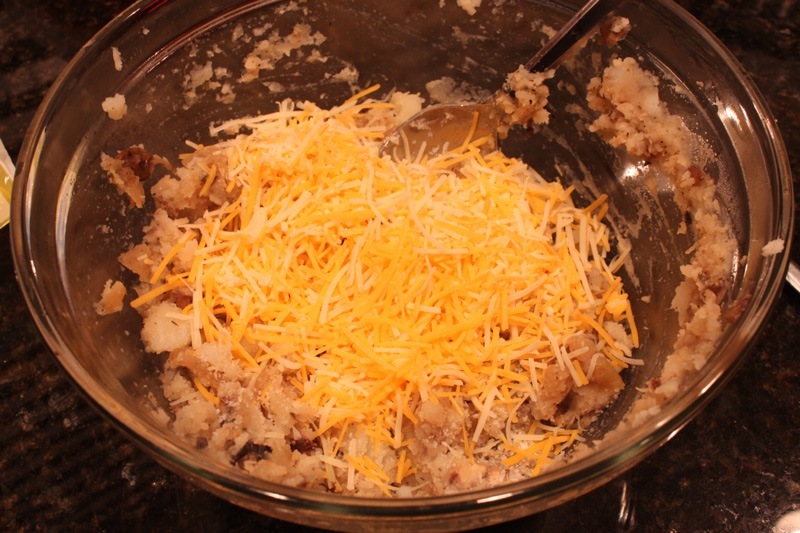 Add half the cheese and mix thoroughly. 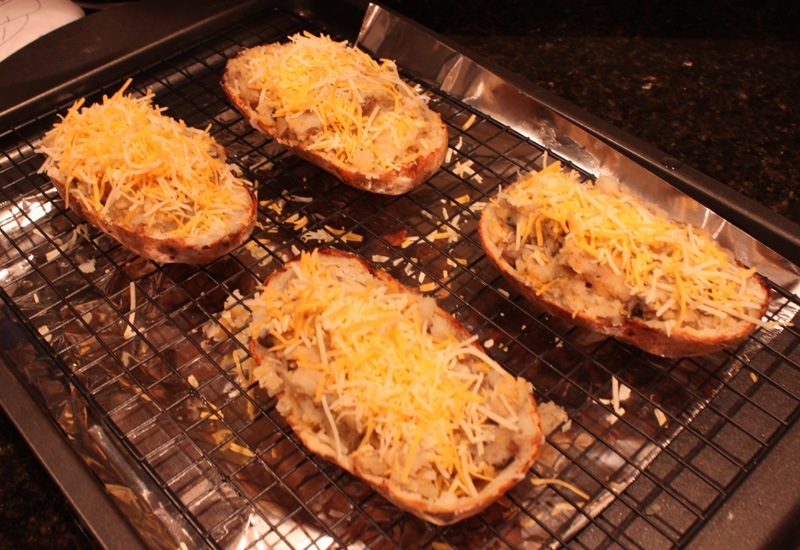 Scoop equal amounts of the filling into each potato skin. Top with cheese, place on a wire rack on a baking sheet, and bake on 350 degrees for 5-7 minutes or until the cheese is melted. John gobbled up his potatoes faster than I have ever seen him eat anything before. 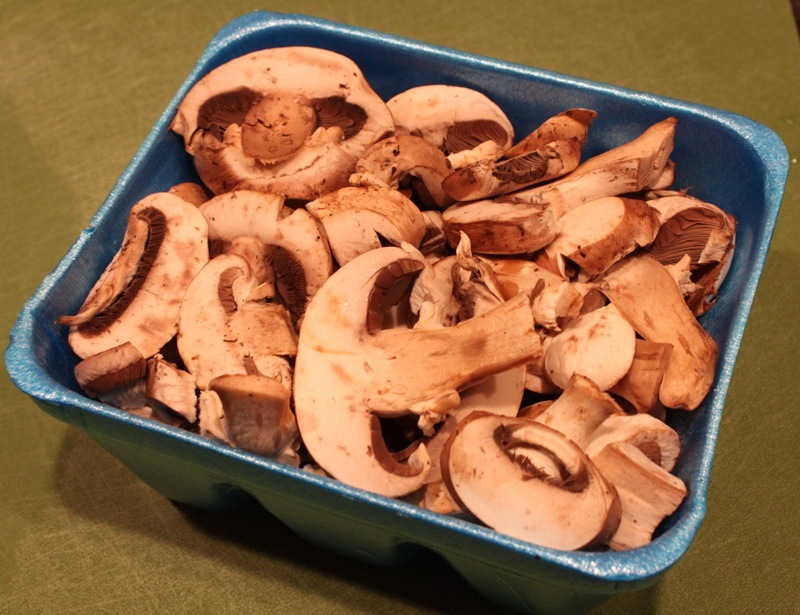 They were the perfect addition to my healthy dinner of roasted chicken and garlicky spinach. 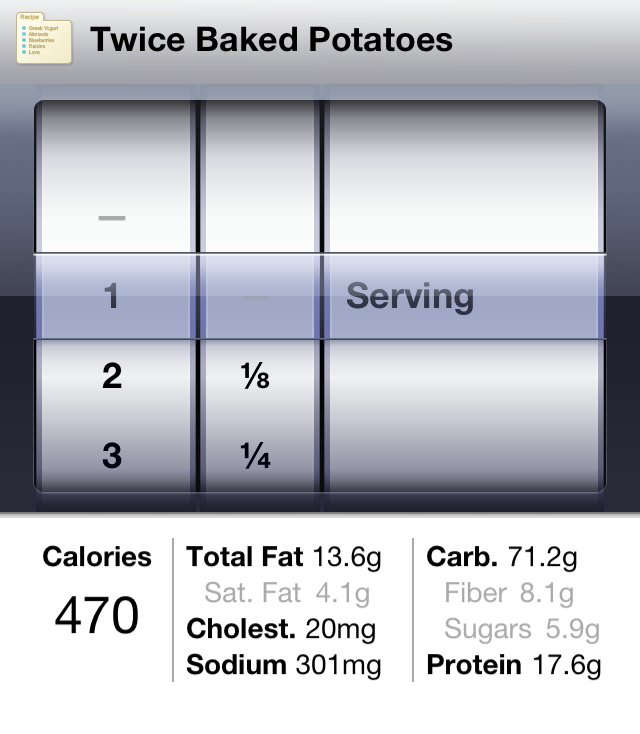 I counted one whole potato (two stuffed halves) as one serving. Calculated with my Lose It app. I love baked (and twice-baked!) potatoes! 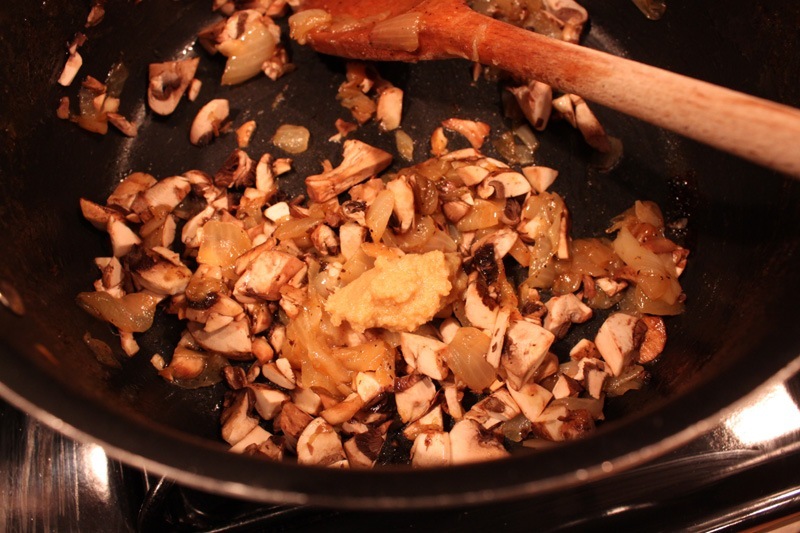 And what a great idea to have a batch of caramelized onions around just in case. I do it all the time, it’s so handy.